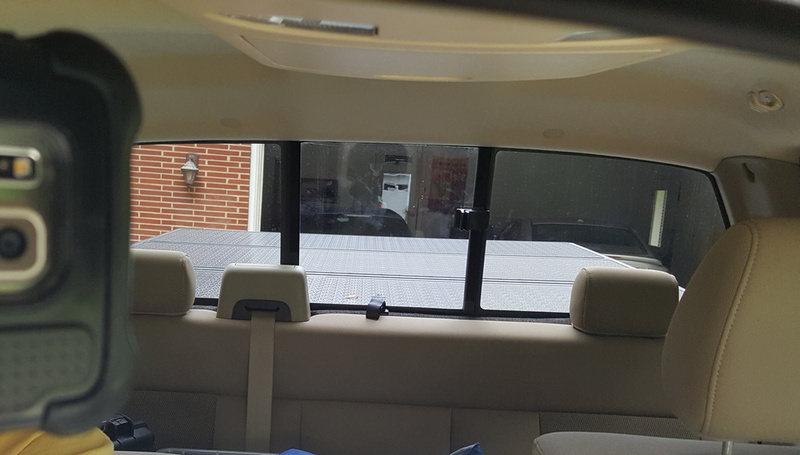 I got a new tonneau cover for the truck. The old one was never great. Fighting the "hoops" to get them on, and fighting the vinyl cover (especially in cold weather) was a pain in the neck. The biggest pain was the rear bar that would not stay down. The clips that were supposed to hold it in place didn't last more than a few weeks. (This was an Xtang is you want to know). Xtang did replace the first one for free, and it lasted a while, but eventually started popping loose. I also had to worry about getting a large snow load on it as that could buckle the hoops. That happened once on the one I had on the F250. So I had made a prop to help hold a snow load, but you had to remember to put it in place. So I bought a new tri-fold "hard" cover. It has aluminum panels. It fits great, it clamps down tight. It doesn't leak rain water. This is what I see through the rear view mirror. It looks good and it's not flapping in the breeze. Looks good. Fits great. Very easy to use. And I can lock the tail gate and keep things secure.